For several decades during the Viking age, parts of England were occupied by the Norsemen. One of the larger cities under their control became a flourishing centre of trade and artisanship. The Vikings called the city and its surrounding kingdom Jorvik - today known as the City of York. 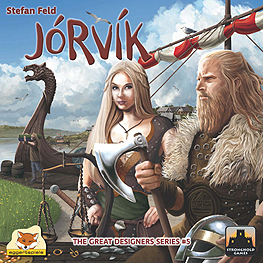 In Jorvik players gather victory points by trading goods, holding big feasts, funding pillages, commissioning artisans and hiring warriors to defend Jorvik against the sneaky attacks of the Picts! The introductory "Karl" game mode and the challenging "Jarl" game mode, for experienced and much more cunning Vikings!